That said, Woodstock really isn’t about the music. That may sound like a strange thing to say, considering that almost every concert film made since owes a debt to Woodstock but really, the most interesting parts of the film aren’t the performances. Instead, it’s the interviews with the people involved, not only the concertgoers themselves but also the citizens of the nearby town of Bethel, New York. Some of the people interviewed as very positive about the sudden hippie invasion. Quite a few others are not. One older man seems to be more concerned with working on his car than anything else. Like any good documentary, Woodstock provides a record of the time when it was made. As much as I like music, I absolutely love history and, to me, that’s the main appeal of Woodstock. Watching the film is like getting a chance to step into a time machine and experience an age that I would otherwise never get a chance to know. Whenever I watch Woodstock, I’m always struck by the fact that I probably would not have enjoyed it as much as some of the people who attended. I have a feeling that I’d be like that poor girl who is spotted about halfway through the film, crying about how it’s too muddy and crowded. I always cringe a little when I see everyone bathing in the same dirty pond. (A young Martin Scorsese worked on the film and reportedly spent the entire festival wearing an immaculate white suit. That’s something that I would have liked to have seen.) And yet, at the same time, I just find the documentary fascinating to watch. I always find myself wondering what became of the people who were interviewed in the film. How many of the hippies are still hippies and how many of them eventually ended up working on Wall Street? Did the cranky guy working on his car even bother to see the film? (It wouldn’t surprise me if he didn’t. Movies, especially movies about a bunch of stoned hippies, really didn’t seem to be his thing.) To me, questions like those are what makes a movie like this fascinating. As an event, the original Woodstock is often cited as being the best moment of the 60s counterculture. (30 years later, the 1999 Woodstock would be remembered as one of the worst moments in the history of both music and American popular culture.) As a film, Woodstock is undeniably optimistic that the people who braved the rain and the mud so that they could see Joan Baez would somehow manage to build a new society. Still, sharp-eyed viewers will note a hint of what was to come. One of the first people interviewed in the documentary is a local shopkeeper. As he speaks, a newspaper can be seen over his shoulder. The headline reads: “Sharon’s Pals Balk At Probe,” a reference to the investigation into the murder of Sharon Tate by Charles Manson and his followers. Seen today, that headline serves as a reminder that, even at the time it was occurring, the peaceful promise of the original Woodstock would be short lived. There’s another Thanksgiving tradition besides gorging on turkey’n’trimmings and watching football (which usually ends up with me crashed on the couch! ), and that’s listening to Arlo Guthrie’s 1967 story/song “The Alice’s Restaurant Massacree”. Here in chilly Southern New England, I catch the annual broadcast on 94-HJY (Providence’s Home of Rock’N’Roll) at noontime, just before the yearly chow down. Arlo’s one of our own, though born in Brooklyn a long-time Massachusetts resident, and still frequently plays concerts around the state (catch him if he’s in your neck of the woods, he always puts on a good show). Now that you’ve watched Blood Freak, be sure to take part in another great Thanksgiving tradition and spare 18 minutes to learn about the day that Arlo Guthrie was arrested for littering and how that heinous crime later effected his draft status. 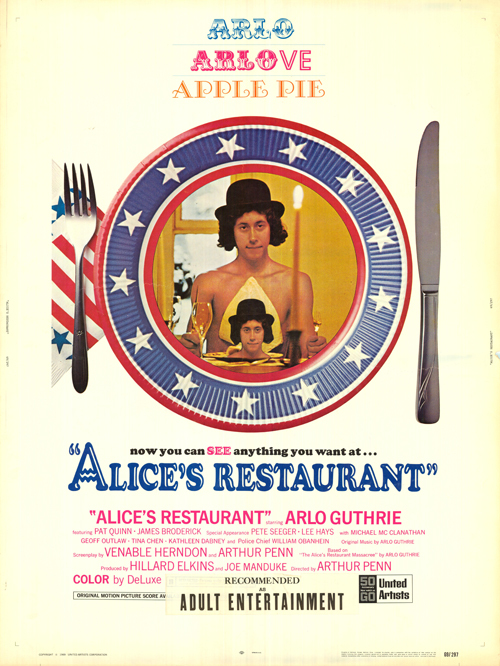 On its 50th anniversary, enjoy Alice’s Restaurant Massacree and have a wonderful Thanksgiving!